Welcome to my wee corner of blogland. I discovered the Retro Cafe Art recently, and they have an awesome give-away of a page of images.. so I downloaded it, and trialed my new printer with amazing results. The feature image on this card is just one of the images on the sheet. I cut it out and distressed and sponged the edges and stamped the sentiment on it. It made me think of old bundles of correspondence that our mothers and grand-mothers would have kept from their men fighting overseas, so I ran the ribbon around just the end of the card image, and added the prima rose, to add to the sense of nostalgia. I layered that onto an gold embossed, pink toned dp , which I felt reflected the colour tones of the image, and because it is so highly patterned and shiney, it makes the matte image 'pop'. This was layered onto an off-white base card which I had also sponged the edges of. Paper: Kaisercraft Sweet Nothings pad. Greetings, and I trust you feel welcome here - I am so pleased to see you visiting. I was asked to make a card for an older woman recently. I started with the Card Patterns Sketch #170, but I digressed as I went. My starting point was the paper and scalloped cutout from a paper pad. I had no blue ribbon to match, so cut and folded a piece of organza fabric I had on hand, covering the edges with the cutout. As I had chosen to use a blue card base, I wanted to bring out the pink of the roses with the sentiment and butterfly. The sentiment was silver embossed on pink vellum, which was then mounted on white card with the edges sponged with distress ink, and all corners punched to round them. I used the same layers for the butterfly after (dry) embossing. The final details were the pearls - pink on pink, and champagne on the cut out and corners. The butterfly was mounted on a die cut circle of blue card stock using foam tape to give some dimension. Card stock - blue base from 'Rosies Studio" pad and scraps of blue and white. Welcome once again. I am so glad you visited. 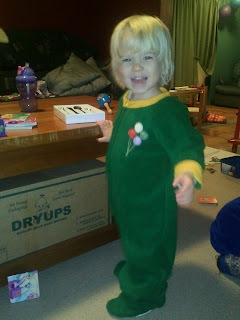 I mentioned that I was making sleep suits for Munchkin the other day - these are the results. Munchkin's Mum did not want feet in his sets, rather a long hem to allow for growth - something he is constantly doing!! She also chose a lighter, printed fabric. Here are the two cousins modelling their new sleepwear. Love these two little people! Thank you for visiting - I trust you feel welcome here in my corner of blogdom. Today I am sharing a birthday card - I am happy with it, and it was easy to make as it basically did what I had planned - not all my cards do that! My starting point was the dp - it was a scrap left over from another card from a sheet off the Kaiser Miss Nelly stack. The blue base card matches the blue in the stripes perfectly. I then made my own dp for the top panel using an old stamp (one of my originals) which I have no idea where it has come from as it is unmarked. This is a close up of it - it is a beautifully detailed rose. The sentiment was stamped in the same blue ink and cut using the 3rd largest Floral Oval SB die. I sponged the card before removing the die. After assembling the card base I added the adhesive ribbon and then the diecut, added some clear rhinestones and the layered flowers. As a final detail I decorated the inside with a scrap of the dp and a couple of roses stamped off the edge. Welcome - thank you for calling in. I have definitely come to the conclusion I am (getting) old - time is moving too fast, well, much faster than me! It came as quite a surprise when I realised it was over a week since I had blogged. I have been busy with various things - getting the gardens sorted ready for the worst part of winter, giving the lawns a final mowing, etc. In my spare moments I have been crocheting flowers.... this is my stash so far. So here are four I did a few weeks ago as samples for KiwiStamping. I have also started on another two sleep suits - this time for Munchkin, Button's cousin - he is three weeks younger, but whereas she is a petite 2 year old (in the 25th percentile for her age group) Munchkin is a big boy - up somewhere in the 94th percentile or there abouts. It is amazing me just what that means for sewing the same pattern for them... major adjustments in some areas!! Welcome once more to my corner - thank you for visiting. I simply sorted the strips and then adhered them to a piece of scrap card (I said I was tidying). I chose a neutral colour as a base, and embossed then sanded the card to show the white core, and sponged a dark brown ink around the edges. The colour choice was because I needed this for a man. The sentiment was gold embossed on a dark olive paper, and cut with a spellbinders Labels 14 die, and embossed. I added the strip of ribbon across the top with a simple knot in it - this is to hide where the embossing folder did not reach. Another wee tab of ribbon and the card was done - in about half an hour. My desk was a wee bit neater and I was one happy camper. Delicious Doodles Challenge #21 - For the Fellas. Welcome - I hope you enjoy this change of pace. We are owned by a much loved nearly 13 year old cat, who recently thought he could commandeer the spare bed after I had taken the sheets off following some visitors. He was sound asleep on the bare mattress when I went to make it, so I simply threw the under blanket over him to make him move, which he reluctantly did. and then in true cat fashion, he walked out of the room and has not been back on the bed - despite it being his preferred place to sleep for the previous two weeks! Oh the joys of being owned by a cat. I had a card to make the other day for a youngster who loves snails!! So my choice of image was rather simple. The background was made by spraying ink onto white card - only my wee sprayer has almost flat batteries, so it leaves a rather speckled effect. I added extra green across the bottom of the card. The sentiment was embossed using red embossing powder and then filled in with gold Kindy Glitz. These happy snails were stamped in with Walnut distress ink and embossed, then watercoloured with distress and dye inks. They were then fussy cut and mounted across the bottom of the card using foam tape for some dimension. To create a 'slime trail' I used some twinkling H2O paint. The panel was them mounted over green and red layers and finished with green and red bling in the corners. Craft Room Challenge - Birthdays! foam dots, gold Kindy Glitz. Welcome once more, and thanks for calling by. No, the fish is not experimental, but the background is! I came across this technique a few days ago and wanted to try it out - never mind the fact that I am limited by having only three colours of alcohol ink and the gold and silver 'mixatives'. The less than impressive result is in the back ground of this card. Do not think that this is the way it is 'supposed' to look, the 'teachers' example is far better!!! I used a blue and black ink to mix, but the black when diluted to 'run' had a distinct red tinge... not happy with that look, I then added some silver mixative, which didn't really run and mingle, but gives some awesome shine to the card. Not being one who likes waste, when I needed a masculine card for someone who loves fishing, I used my 'experiment' as a background. I printed off this digi stamp and coloured it with chalks - hmm, fish are shiny, so I tried another thing that I had never tried before and painted over it with Twinkling H2O paint, and it worked. Not the best, but you may just be able to see the sheen in this photo. And this is the final result!! The sentiment was embossed in silver on the base and the brads and pearle thread were the finishing details. Now don't you think the background looks like water disturbed by a fish? ....... come on, it's not that hard to think that, surely? o.k., you win :-). Allsorts Challenge #157 - "Oh I do like to be beside the seaside"